Today, on my way home, I noticed that our Twin Peaks daffodils are popping up! We've had some warm weather lately and I assume they are confused. ;-) So, as you're driving down Hwy 189 through Twin Peaks, be on the look out for our little yellow and while beauties. (As of right now, they're about four inches high). The little story below makes our daffodils even more special. Tom and Julie Greer married in 1978 and made the tiny town of Twin Peaks (one of Lake Arrowhead's surrounding areas) home. Since one of Julie's favorite flowers was the sweet, bright daffodil, in 1999 she decided to plant several hundred of those darling flowers (bulbs). She accomplished her first plantings with help from a neighbor. 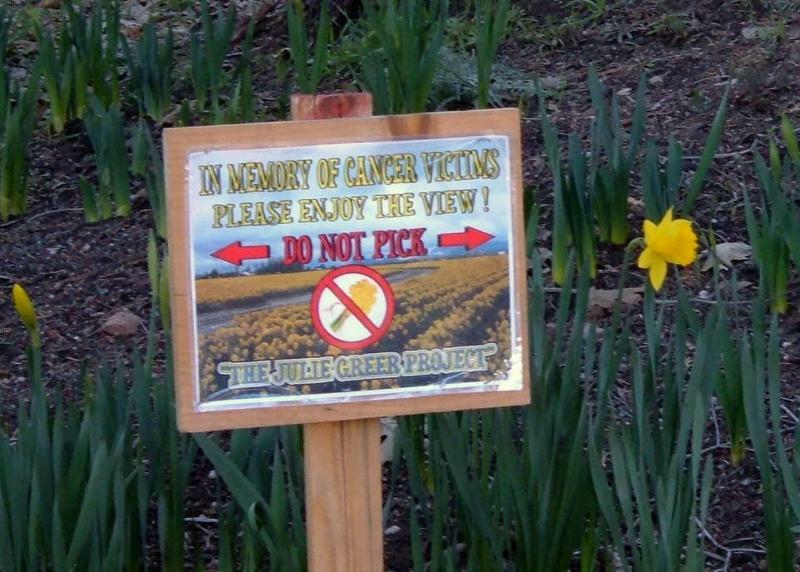 One of Julie's dreams was to see all of Twin Peaks filled with her beloved daffodils. The next year she purchased 1000 daffodils bulbs and she & Tom planted them! In 2000, another 10,000. Julie's dream became Julie's Project. Daffodils are only around a few weeks (usually) in April. If you'd like to see this wonderful "project," you'll need to get on up here soon... Map & Directions. Oh I do love daffodils. That is definitely a sign of spring. Enjoy!